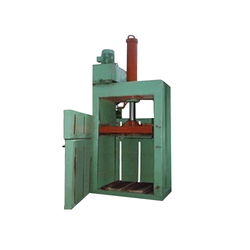 We are a leading Manufacturer of hydraulic waste baling press machine from Nagpur, India. Platen size 24" x 30"
Bale Height 18" to 24"
Our firm is involved in providing Hydraulic Waste Baling Press Machine in the market. The baling press offered by us is widely utilized for reducing the volume of scrap material that includes plastic bottles, paper, and corrugated boxes.